Portable and attractive, these American-made digital portable scales with 5 inch diameter rubolene wheels let the weighing come to you. With a platform size of 19 x 28 inch (48 x 71 cm) and capacities of 500 or 1,000 lbs, there is very little these scales aren’t capable of weighing. 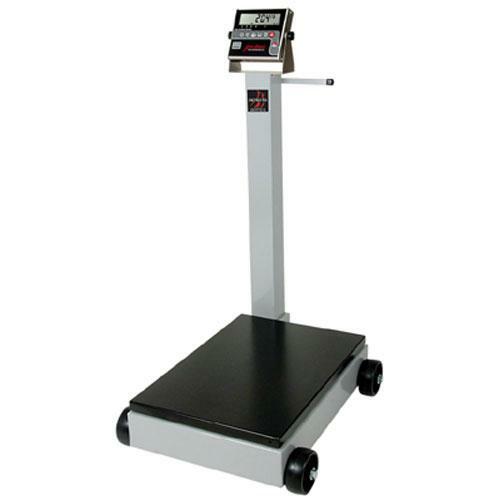 Models are constructed entirely of heavy-duty welded, fabricated steel with electrostatic paint coating, and are equipped with either a 204 or 205 digital weight indicator having push button tare, pounds/kilograms conversion, and RS232 serial output. NTEP legal-for-trade certified.